Kenya’s oil ambitions received a boost after the government reached a revenue-sharing deal with the Turkana local government and community where the lucrative oilfields are located. But the road to first oil and sustained production remains fraught with political uncertainty and volatility as some within the local community still remain unconvinced. Kenyan President Uhuru Kenyatta said Saturday that a deal was struck specifically on the revenue-sharing provisions of the Petroleum Exploration and Production bill, paving the way for the country to start its maiden oil exports, a year after it was originally planned. According to the statement, 75% of the oil revenues will be going to all Kenyans through the national government, while 20% will be allocated to the county government and 5% to the local community. Production from the Turkana oil fields will start without any hindrance after an agreement was reached on sharing of revenue. 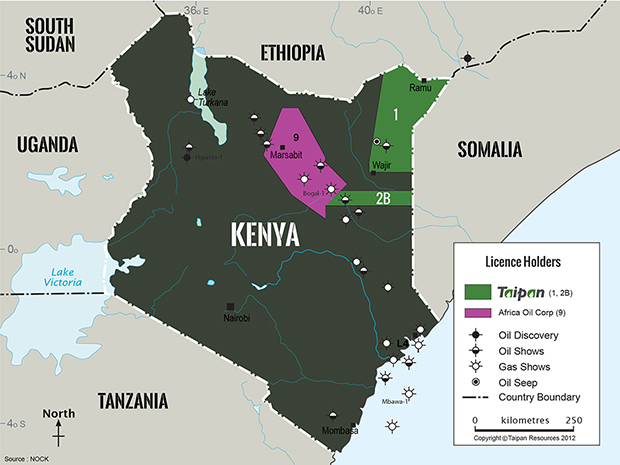 Kenya’s oil ambitions received a setback last June due to issues on revenue sharing arising among the national government, local government and local counties. But according to some local news reports, there is still some opposition to the current deal which could prove an obstacle to Kenya’s oil ambitions. Tullow and its partner Africa Oil discovered 750 million barrels of recoverable resources in the Lokichar Basin following a string of successful finds starting in 2012. Tullow said in a statement it is “technically ready” to start the maiden trucked exports known as the Early Oil Pilot Scheme. “In light of the recent agreement between the National Government and leaders from Turkana county regarding revenue sharing, Tullow is working with both the National and County governments on a suitable flag-off date for EOPS in the coming weeks,” said the UK-based oil explorer. Earlier this year, Tullow said it aims for a final investment decision for the Kenyan project in 2019 with first oil poised for 2021-22 and expects production of 60,000-80,000 b/d at its Central Processing Facility along with building an export pipeline from these fields to Lamu. Under the original plans, Tullow was to transport up to 2,000 b/d from the Turkana fields in northwest Kenya by truck in a three-day journey to the port of Mombasa on the Indian Ocean. Initial exports from Mombasa will only be short term as the government hopes to boost its crude exports via a planned pipeline from South Lokichar to Lamu on Kenya’s Indian Ocean coastline after 2020. “We now have an understanding that can put Kenya on the map of oil exporting countries,” Kenyatta said in a statement.